Nikolay, a shaman from Tuva (Southern Siberia, Russia), is a virtuoso of throat singing, healer, musician and recording artist. 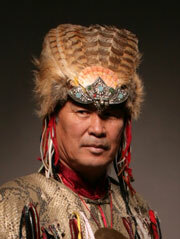 He is ex-Chairman of Tuvan shaman society Tos-Deer and has been a participant in several International Shamanic Congresses. He has years of healing practice at Central Shamanic Clinic in Kyzyl (Tuva), where he completed his research work Shamanic Practice in Combination with Healing Sound. While in India celebrating His Holiness the Dalai Lama's 60th birthday, he received the Dalai Lama's blessing for his healing work. Nikolay acquired first prize at the First International Festival of Throat-Singing (Tuva). He is cofounder of ensembles "Tuva" and "Ertinelig Tuva.“ He is a welcomed guest at different folklore, jazz and New Age festivals in ex-USSR and Europe. Nikolay expressed unique talent for jazz improvisation and has actually developed a new direction in ethno-jazz: "khoomei-jazz." He has five CDs to his credit and is author of Un-Hun System of Sound Healing, a rejuvenation and spiritual development based on ancient shamanic tradition of throat singing. Un-Hun (the Sound of Sun) is a powerful sound-based system, developed by Nikolay Oorzhak through decades of his personal experience. It is based on Tuvan shamanic tradition and adapted for the western world by his disciple Dr. Vladislav Matrenitsky. Through the practice of overtone sounds, one can find the basis for healthy and spiritual living. The Sound, being transformed into energy, spans the space of mind and creates the preconditions of initial contact with Spirit of Highest Power. Learn the basic sounds of Khoomei (throat singing), Kargyraa (roar) and Sygyt (whistle). They’re used to activate the primordial power of human Soul and arouse the sources of life energy, enabling one to perceive and operate the sounds on thin levels. Activation of these sources (whirls of energy) lead to restoration of energy in associated body organs, particularly in pelvis area. Nikolay and Vladislav also give a technique for developing resonance of nose and vocal cords, which harmonize and strengthen the voice, and exercises for restoration of balance of body and spirit. This program is a combination of lecture, sound healing demonstration, exercises, singing, discussion and question and answer. You are introduced to the sound philosophy of Tuvan shamans and how it is interpreted by modern science. You will learn the shamanic views on human energy, Power of Spirit, Earth and Universe and how 'explosions' in consciousness lead to loss of balance in the body and development of diseases. The different styles of throat singing are introduced and their role in healing and self-development are explained. You will see the importance of breathing and movement exercises in creating energy for sound. This program helps to improve energy movement in the body and lets you feel the power of your shamanic instrument – The Voice. Goal: To show the ways Tuvan shamanism for harmonization of mind and body with sound are used. Learning Objectives: To show the ways Tuvan shamanism for harmonization of mind and body with sound are used. To learn the basic overtone sounds for self-healing. We shall delve into the unique heritage of South Siberian steppes and taiga – the throat (overtone) singing. It is an ancient technique that allows a singer to produce simultaneously two or more musical sounds from their mouth. Admirers of ethnic and meditative music will have unforgettable impressions. We’ll practice a wide range of sounds including a bird’s warble to a yak’s roar, which it would seem a man could not produce. For centuries, Tuvan shamans have used this technique for immersing into altered states of consciousness and healing their patients. Accompanied by native Tuvan instruments, tungur (tambourine), igil (kind of violin) and homus (vargan), the ancient and modern shamanic songs create a deeply relaxing and meditative atmosphere giving the audience a chance to touch a real sacred art.